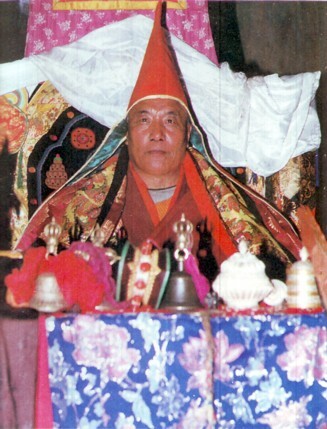 Sherab Özer Rinpoche (Tib. ཤེས་རབ་འོད་ཟེར, Wyl. shes rab 'od zer) (1922/3-2006) was recognised as the incarnation of Orgyen Rigdzin Sempa Dorje (Wyl. o rgyan rig 'dzin sems dpa' rdo rje), the main Dharma heir of the great master Nyala Pema Dündul. From an early age he studied with many revered masters in East Tibet. At twelve, he studied the sutras for three years at Lumo Rab, a monastery which has a very strong connection with the great Mindroling Monastery in Central Tibet. In fact, it was from Minling Khenchen Rinpoche and Minling Chung Rinpoche that he received the name Sherab Özer. At the age of 21, he went to live in the labrang at Kalsang Gonpa, the seat of Nyala Pema Dündul, which later became the seat of Tertön Sogyal Lerab Lingpa. He received the teachings and profound instructions of Dzogpachenpo from Tulku Dorje Dündul at Dre Tsal Monastery, the empowerments and teachings for Nyala Pema Dündul’s revelation Zabchö Khakhyab Rangdrol from Jazi Anyé Tulku, and studied and practised with masters of the Sakya, Gelug and Nyingma schools. In 1949, Sherab Özer Rinpoche was asked by Chinese government to help in local affairs, and later, during the Cultural Revolution, he passed through many difficulties. In 1981, he visited a number of different monasteries, as a result of which he set up, in Sichuan province, thirty four “Cultural Heritage Protection Associations”. In 1984, Rinpoche founded the Sichuan Province Tibetan Buddhist Institute. In 1998, Sherab Özer Rinpoche stayed in Lerab Ling for several months and gave several teachings and empowerments (Tendrel Nyesel and Khakhyab Rangdrol) to the Rigpa sangha. On August 12th 1998, Sherab Özer Rinpoche performed a simple, symbolic ceremony in which he offered the throne of Kalzang Monastery to Sogyal Rinpoche as the heir to Tertön Sogyal. ↑ Most probably Minling Khenchen Ngawang Khyentse Norbu. This page was last edited on 13 February 2019, at 07:20.